Fire alarm business sales can be complex, but they can also be successful and immensely profitable if handled the right way. At Acquisition & Funding Services, we have decades of experience handling the mergers, acquisitions and sales of alarm businesses of all kinds, including fire alarm companies and fire integration companies. As a knowledgeable broker, we know what it takes to connect you with well qualified buyers who are willing to pay top dollar for your fire alarm company or accounts. What sets us apart when it comes to selecting an ally to guide you through the fire alarm business sale process? Service revenue is among your fire alarm company’s most valuable assets. Brokers and buyers not familiar with fire alarm companies may not realize this, which may cause your company to be undervalued. At AFS, we know the value of service revenue and we’ll help you find a buyer who is willing to pay top dollar for the company you’ve worked hard to build. An accurate fire alarm business valuation is imperative if you want to sell your company for maximum profit. Fire alarm companies cannot be accurately valued based on the traditional recurring monthly revenue (RMR) model. Other factors should be considered in order to calculate an accurate value for your alarm business and, in turn, get you the most for your company when it comes time to sell. As a result, having an experienced fire alarm company broker on your side to help you understand the true value of your business can be hugely helpful. Our fire alarm business valuations take service revenue and a variety of other factors into account, ensuring that you – and your potential buyers – have a complete understanding of what your organization is truly worth. Finding well qualified buyers can be challenging. 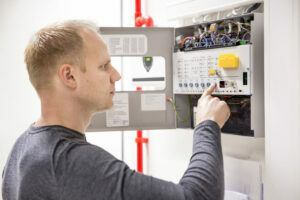 If you’re seeking a fire alarm business or integration company buyer willing to pay top dollar, working with a fire alarm company broker can be a great way to connect with one. 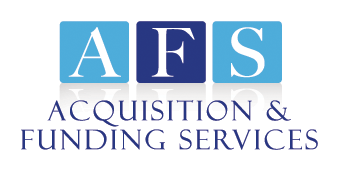 At AFS we have access to buyers interested in purchasing companies and accounts like the ones you have for sale. We can help match buyers and sellers so that the fire alarm business sales work out favorably for everyone involved. 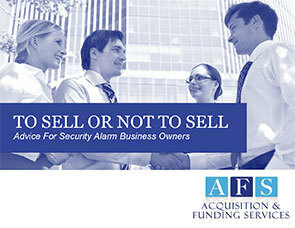 If you’re planning to sell your fire alarm company now or in the future, AFS can be an invaluable partner. From helping you to position your company for a successful sale to accurately determining the value of your business and helping you coordinate the sale with a qualified buyer willing to pay top dollar, Rory Russell can guide you towards a profitable sale that you can feel confident moving forward with. Interested in learning more about how AFS can help you sell your fire alarm business, accounts, or integration company? Give Rory a call today at (800) 354-3863 or contact AFS online to get the conversation started. Four Things You Need to Know About Alarm Business Sales – Learn about some of the key complexities related to fire alarm business sales and find out how a broker can help you navigate them. Fire Alarm Business Valuations – Review tips for ensuring that you have an accurate understanding of what your fire alarm company is truly worth. Service Revenue in the Fire Alarm Industry – Understand why service revenue is so valuable in the fire alarm industry, and find out how to capitalize on that revenue when it comes time to sell.